To log in, first you need to register as one of the following: an athlete, an affiliate, or a fan. You will also need to accept the terms and conditions of use for this site. Once you have registered with a valid email address and password, you will be able to use them to log in. How do I register for this site? If you are not already logged in, a button called "Register" will appear under the main navigation bar, next to the button called "Store." Click on this, and it will take you to the registration landing page, where you can choose to register as one of the following: an athlete, an affiliate, or a fan. There will be a one-time online payment ($10 US for athletes in the United States and Canada, $5 US elsewhere). Team registration will be a one-time fee of $20 per team. All members of the team must first register as individual athletes. An athlete cannot be on more than one team. There is no limit to the number of athletes on a team. There is no fee to add athletes to a team once the team is created. Registration will be open to anyone throughout the 6 week competition. However, anyone aspiring to compete in the 2011 CrossFit Games must register as an athlete and submit their first performance prior to Sunday, March 20th at 17:00 PDT. All performances, results and rankings will be entered and displayed on the official CrossFit Games Open website. There will also be free registration for fans, which will give you the ability to customize your views and reporting, and comment on the site. WRONG REGION: I signed up with the right region info. Why does my account display the wrong region? This will be fixed shortly. No action is required by you. I registered as both an affiliate and as an athlete (or spectator) using the same email address. Why am I having problems logging in or accessing my accounts? I registered as a fan, and I would like to compete. Can I re-register using my email, or do I have to have another email address to register as an athlete? Yes. You will need to use another email address of yours to register multiple accounts. I am having trouble logging in to an account that is registered. What can I do? Send us an email at support@crossfitgames.com. I am trying to register but am getting an "empty cart". Am I doing anything wrong? Am I getting charged? We are aware that this is happening for some registrants while others are able to successfully register. If this is happening to you, the registration attempts are not being charged. We are diligently on the case. We recommend spacing out your attempts as this is a top priority for us and we will have a fix in soon to resolve this for everyone. What are dates of Regional Competition? The Regionals will take place over four weekends from May 27th through June 19th. There will be approximately 4 Regionals per weekend. The exact schedule and boundaries of each region can be found here. What are the region boundaries this year? The geographical boundaries for each region can be found here. How many athletes from each region will advance from the Open to Regionals? The top 60 men and top 60 women as well as the top 30 teams from each region will advance to Regionals. The top 20 Masters men and the top 20 Masters women in each age bracket from around the world will advance to the Games based on their performance in the Open with no regional competition (the four age brackets are: 45-49, 50-54, 55-59, 60+). Who is automatically qualified for Regionals? Everyone who aspires to compete in the 2011 CrossFit Games must compete in the CrossFit Games Open. No one is prequalifed for Regionals. If someone qualifies in the top 60 in their region and chooses to participate with their affiliate, will the person that finished in 61st be offered to participate in Regionals as an individual? And so on down the line? No. Only the top 60 in each Region are invited to the Regionals. If some of those athletes choose to compete for their team, then fewer athletes will compete in the individual competition. Can you give me the details for the CrossFit Games Open? How will this work? All athletes that wish to participate in the Open must register online and pay a one-time fee ($10 in the US and Canada, $5 international). This payment will gain the athlete access to the Open website’s online database and enable them to participatte in the Open. The first workout will be released on March 15th, 2011 at 17:00 PDT. The Official CrossFit Games Open website will go live the week before. You will be able to pre-register there and then. Each week’s workout will be released each Tuesday at 17:00 PDT here. Athletes will have from the time the week’s workout is released until the following Sunday at 17:00 PDT to complete the workout and submit their results. 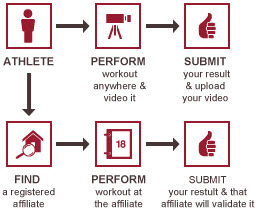 Athletes are required to submit a video of each workout unless they complete the workout at a registered affiliate. Official CrossFit affiliates in good standing will have the ability to opt-in each week as a host for that weeks’ workout. They will commit to upholding the standards and ethics of the CrossFit Games and assert that they have the equipment and facility to administer the workout. Each athlete is responsible for the timely and successful completion and submission of their workout. Performance of the workout at a registered affiliate is an option so long as it works for both the athlete and the affiliate. A video submission is required in all other circumstances. What if work or other commitments prevent me from participating in one weekend of the Open? Will there be make-ups? No. There will be no opportunities for any athlete to make-up a workout they missed. You have 5 full days with which to complete the workout and submit your performance. Because of the video option you can perform the workout virtually anywhere. If you miss a week you may continue to participate in the Open, but you will not be eligible to qualify for Regionals or the CrossFit Games. How will CrossFit prevent doping? Which drug testing policy will be in effect for the 2011 Games? By participating at any level in the 2011 CrossFit Games, an athlete asserts that they do not use performance enhancing drugs, and they may be subject to testing at any point in the season. The official drug testing policy can be found here. Are substitutions allowed for the Open workouts? Anyone aspiring to compete in the 2011 CrossFit Games must complete each of the six workouts as prescribed. Any substitutions or modifications will disqualify the athlete from advancing. That said, anyone can participate in any or all of the workouts and post their results. Must each Affiliate Team have an equal number of males and females? No. For the CrossFit Games Open, the team may have as many athletes as you choose. Only the top 3 men and top 3 women from each team, each week will be counted. How will the teams be scored? What are the complete rules for Team Competition? Team qualification for the 2011 Affiliate Cup will begin with the Open. The format for this first step will be similar to the ‘07 and ‘08 Games. There will be two types of teams: Official teams and Other teams. "Official" teams must include at least 3 men and 3 women. All of the athletes on a team must train at the same gym. There is no maximum number of participants on a team. Each athlete can only compete on one team. All team members must register and submit their first result by Sunday, March 20th at 17:00 Pacific, the closing date for submissions on the first Open workout. "Other" teams can be any collection of athletes but cannot qualify for Regionals or the Games. There will be a $20 fee to set up a team. The fee will be the same regardless of the number of athletes on the team. Athletes may compete in the Open as an individual AND as part of a team. Their scores will count for both. If an athlete qualifies for Regionals as an individual and their team qualifies, they will have to choose between competing in Regionals as an individual or on their team. The number of athletes registering for a team in the Open will have no upper limit. The affiliate team with the most participants at the end of the first week gets two free spectator tickets per athlete to the 2011 CrossFit Games, their next affiliate fee waived, and a plaque commemorating their achievement. Yes, if the winning team has 250 participants, we're giving away 500 spectator tickets to the Games! To be eligible for Regionals, the team must be an Official Team. See the details for Official Teams above. A team's score will be calculated by the combined effort of its top three men and top three women. This combined result will be ranked with every other official team’s combined result. The final ranking for the week will be the team’s score for that week. The overall score is the sum of each week’s score. There is no requirement that the same athletes be the ones scored each week. For an athlete’s scores to be able to count for their team’s qualification efforts in any given week, they must still be “in the running” as an individual. This means that they cannot scale, DNF, or be disqualified for missing range of motion on any previous week’s workout. There is no limit to the number of athletes who may compete for an Official Team each week. The only restrictions are: an Official Team must be composed of at least three men and three women, teammates must all train at the same gym and use the same equipment, and there may be only one Official Team per affiliate or training group. A maximum of 30 teams from each region will qualify for Regional competition. The number of teams that will qualify for the Games from each Regional competition will match the number of individual competitors that qualify from that region. If three male individual competitors, and three female individual competitors, will advance to the Games from a region, then three teams will qualify for the Games from that region. If two men will qualify, and two women, then two teams will qualify as well. A team’s roster may change between the Open and Regionals. It is the team, NOT the list of individuals, that qualifies from the Open to Regional team competition. Qualified teams may select any group of individuals from their gym to represent them at Regionals, whether or not they competed in the Open. Can I compete in the Open as an individual and on my affiliate’s team simultaneously, or do I have to pick one? You can compete as both an individual and as a part of an affiliate team. This is run like the ‘07 and ‘08 Games. You are competing first as an individual and second as a team member. Your scores count for both. In terms of Regionals, if your team qualifies and you happen to qualify as an individual, then yes, you must choose since you won't be able to compete in both competitions at the Regionals. Just like last year, the team itself will qualify for Regionals, and not necessarily the individuals who competed for the team. This is seen in all team sports. The Steelers are still in the Superbowl even if Roethlisberger doesn't play. Do all individual competitors and teams have to be based out of a CrossFit affiliate? No, you do not have to train at an affiliate to compete as an individual or as a team. The only prerequisites for athletes on an Official Team are: (a) all athletes must train at the same gym and use the same equipment, and (b) the team must have at least three men and three women. An Official Team in the Affiliate Cup could be composed of people from a non-affiliate such as a fire house, neighborhood garage gym collective, etc. Teams wishing to register who are not CrossFit Affiliates must contact games@crossfit.com to be manually entered. Alternatively, anyone can form an Other Team and compete in the Open, but these teams are not eligible for Regional competition. See “Complete Team Rules” for the full details. Can one affiliate have more than one team in the Open? A single affiliate can produce only one Official Team that is eligible to qualify for Regional Competition. However, there is no limit to the number of Other Teams that an Affiliate may have participate in the Open. Can an athlete DNF or sub on an Open workout and still have their results count for their team in the weeks to come? No. In order for an athlete’s results to count for their team, the athlete must still be in the running as an individual competitor. This means the athlete must have completed and submitted all previous Open workouts as prescribed. What are the birthday cut-offs for the Masters divisions? How many male competitors and female competitors per Masters age division qualify? For each age bracket of the Masters (45-49, 50-54, 55-59, 60 and up), the top 20 men and top 20 women worldwide will qualify for the Games with no Regional competition. Why did CrossFit HQ decide to change the format from live sectionals to the online Open? The format of the CrossFit Games Sectional is not static, it has changed each year to accommodate the rapidly growing interest in the CrossFit Games. The new format of the Open ensures that anyone in the world has the opportunity to compete. We expect that many, if not most, of the athletes in the Open will compete at a registered affiliate, thereby replicating the feel of the live sectionals of last year. How will the 1 million dollar purse be distributed? The first place male and female individual winners will each receive $250,000. Details on the division of the remaining $500,000 will be released later. Will there be a cutoff or baseline time for the Open workouts or will HQ only recognize the top x number of competitors? There will be no set limit length for workout submissions, however technical limitations may present themselves. Can a military base host Open events for military personnel only? A registered affiliate may limit their Open workouts to whomever they wish. What are the consequences for an affiliate caught with athletes that cheat to get to Regionals? If CrossFit HQ discovers blatant cheating in the Open, then all parties involved will be permanently banned from CrossFit competition, and any CrossFit affiliates involved will lose their affiliation. Will there be a Kids competition like Dave Castro referred to in a video? There is no separate kids component to the CrossFit Games season. I live in multiple places each year (or I’m moving sometime soon). For people like me, how does CrossFit decide my region? Your region is based on where you are living at the time of the competition. If there is any question as to where you belong, please email games@crossfit.com to get clarity. What are the Twitter accounts for the different regions? What should I know, as an athlete or affiliate, about getting the Open workouts validated at a CrossFit affiliate? Each week, an affiliate will have the choice of whether or not to opt-in to host that week's Open workout. By opting-in, affiliates agree to provide the space, equipment, and time for athletes to complete the prescribed workout. They will also assert that they will uphold the standards and ethics of the CrossFit Games. There will be a specific section of the Open website for affiliates to register and opt-in each week. Affiliates who have opted-in will have the ability to host athletes’ efforts and the obligation to validate or deny their posted result. This validation eliminates the need for the athlete to submit a video for that performance. It is up to each athlete to enter their workout result on the website. Once the athlete has put his result into the database, a notification will be sent to the affiliate for validation. Affiliates wishing to host the week’s workout can opt-in as soon as the workout has been posted. Obviously, the earlier in the week that the affiliate opts-in, the easier it will be for athletes to compete in their box. An affiliate opts-in for a single workout at a time. There is no requirement for any affiliate to host multiple workouts, though there is the opportunity to host as many as six. There is no limit on how many affiliates can Opt-In to validate workouts on a given week, so long as they commit to meeting the standards presented. Validating affiliates are agreeing to facilitate the performances of Open athletes for that week. It is, however, the athlete’s responsibility to comply with the schedule and format (including fees) that the affiliate chooses, and to record their performance on the CrossFit Games Open website. The athlete is responsible for ensuring that they have a valid performance each week. If for any reason an experience at an affiliate is unproductive, it is the responsibility of the athlete to either submit video or arrange for another validated performance at a registered affiliate. Since affiliates opt-in each week for that one workout, an athlete may have a workout validated at Affiliate X in Week 1 and find that Affiliate X is not validating performances the next week. Athletes will be able to search for other affiliates in the area who have opted-in using the Open website. All affiliates who have opted-in will be clearly posted on the Open website. It is the athlete’s responsibility, however, to complete and submit their results for the week’s workout, whether at an affiliate or via video submission. If the athletes submit their results, how do I as an affiliate owner make sure that the results they submitted are accurate? Athletes will submit their own performances to the Open website. There is an automatic notification process within the new system that will notify the affiliate of all workouts posted that require the affiliate’s validation. I am an affiliate, what does it mean for me to opt-in? How will it affect the rest of my gym’s regular activities? Each affiliate will determine how often and when they will provide the opportunity for athletes to perform Open workouts. Obviously the more flexible options you can provide, the easier it will be for athletes to compete at your gym. But it is completely up to you to set the schedule and any requirements for athletes to notify you in advance. It is also up to you to determine any additional fees for those workouts. In other words, you can make this as big or small a part of your box as you want. You can use it as an opportunity to build community, create excitement, and throw parties. Alternatively, you can also keep it very small, limit the number of participants, and make it only available to your existing clientele, etc. Whichever way you go, you should make it clear to the public when you opt-in. Will late submissions be accepted? No, late submissions will not be accepted. Submission on the website closes precisely each Sunday at 17:00 PDT. Please allow sufficient time to enter your score and upload your video before that. You have 5 full days. What happens if an affiliate does not have the equipment required for the week’s workout? If an affiliate does not have the equipment necessary for athletes to complete the workout as prescribed, then they should not opt-in for that week. What happens if the affiliate where I have been doing my workouts decides not to opt-in for a given week? What do I do? It is your responsibility as the athlete to submit a valid performance. If the affiliate where you normally perform Open workouts doesn’t opt-in for any reason, you have two options. You may either find another registered affiliate or submit a video of your effort. How will standards be upheld in the video submissions? What will the consequences be for missing full extension on a rep, or other errors? CrossFit HQ will clearly define and explain the movement standards for each workout. Every athlete must meet these standards. Missed reps or incomplete ROM (range of motion) will result in an invalid result. It is strongly recommended that you both have someone watch you and count your reps and that you review the video before submitting it. Once the deadline is passed, there will be no opportunity to make up for a rejected performance. As in every sport, the performance will be evaluated by officials. This is a human endeavor with judgment required. We have a large team of dedicated officials committed to ensuring the fittest athletes advance to Regionals. There will also be opportunities for the community to vote on each video performance, though the ultimate decision on the validity of the performance rests with the CrossFit HQ team. We reserve the right to disqualify a performance, assess time penalties, and/or otherwise adjust the score in order to fairly rank a given performance. Will cut or edited videos be accepted? Absolutely not. Any evidence of cheating or manipulation will result in disqualification from the entire CrossFit Games Season. An affiliate found deliberating cheating or manipulating the system will be de-affiliated. How will we be able to send the videos to HQ? Will there be a system in place to accommodate the large file size of the videos? You will be asked to upload your videos to a public website (such as YouTube or Vimeo) and to send us a link to that video. If you have not uploaded videos before, it is strongly advised that you become familiar with their practices and requirements as soon as possible. It is your responsibility to ensure that the video is uploaded successfully before Sunday at 17:00 PDT each week. YouTube limits videos to 15 minutes. In the case that your performance takes over fifteen minutes, you will need to use an alternative video upload site such as Vimeo. Free access to Vimeo is limited to 500MB per week. We highly recommend upgrading to a Vimeo Plus account for the duration of the Open ($9.95/month); the Vimeo Plus account allows users to upload 5GB per week. Video size varies based on the duration, and quality of the recording. If the video size exceeds the limits for free access, competitors may compress (but not edit) their video so that it meets size limitations. Be cautious with compressing as a video that is too small or too poor quality to adequately judge movements will be rejected. Again, it is the competitor’s responsibility to successfully upload their video. If you perform the week’s workout both at a registered affiliate and at home which score will count? Will a score from a registered affiliate trump an at home score, or will CrossFit take the better of the two? An athlete may submit multiple efforts of a workout. Their best valid performance, regardless of whether it came from a video submission or was performed at a registered affiliate, will count for scoring for that week. Can an affiliate owner validate their own score/time or must they submit a video? An affiliate owner will have their submission validated by their affiliate’s account, however their workout performance must be supervised by a judge. Should I still compete if I don’t think I have shot at qualifying for Regionals or the Games? Yes! You should compete whether or not you think you have a shot at making it to the Games. The Open is for all of the CrossFit community, not just the people who may make it to the Games. You get a chance to compete in the same workouts as CrossFitters all over the world, and track yourself in worldwide standings. If you want to see how your training is going and join a community wide event, it doesn't get much better. The workouts are not going to feature outrageous programming, but rather be achievable for most reasonably fit individuals. Who can judge performances at a Registered Affiliate? Can the judge be anyone, or must they have a L1 Certification at minimum? The legitimacy of the judging is the responsibility of the registered affiliate. We are not going to say who can or cannot be a judge. If the affiliate determines that someone can uphold the standards of judging for a given workout, they are standing behind that decision, and will be held accountable for it. Can a judge watch multiple athletes at once, or must there be one judge per athlete? Each athlete must have their own judge for the workout to be valid. When the workout is released, where will the Opt-in button appear? The Opt-in button will appear on the Workout tab within the Affiliate's Account Page. How will an affiliate agree to the terms of Opting-in? Click on a radio button? Checkbox like legal? Click on the radio button to confirm you are opting-in or you can choose to opt-out. Is there a 2011 CrossFit Games widget that I can put on my website? Unfortunately, there is no widget available at this point. WRONG TEAM: I joined the wrong team. How can I get on the right team? CANNOT JOIN TEAM: Why is there no longer an option to join a team? If you have submitted a request to join a team previously, the captian of that team must either accept or reject your request for you to be able to send a new request to join another team. I created a team on my Athlete account but realized I wanted the team under my Affiliate account, so I created another team with that account. Now I have some people on my Athlete-account team and some in my Affiliate-account team. Newly registered athletes are also confused as to which team to join. What can I do? Have your team members request to join your preferred team. They will automatically be removed from the old team, and once you accpet their request be on the new team. To help clarify, as the captain, you also have the ability to remove members from the team you want cleared out. We also recommend giving intructions in the bio of the old team, directing your members to the team you would prefer them to join. I am totally stuck. Where can I turn to for help?! Email us at support@crossfitgames.com. Briefly and concisely explain what's going on. Check the FAQ or email support@crossfitgames.com. Our customer service staff will be happy to assist you.